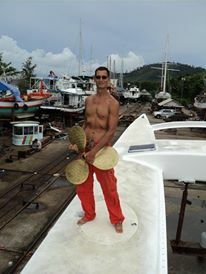 I have sailed in Phuket Thailand now three times. Twice aboard HOT BuOYS SV and once aboard Infinity SV. 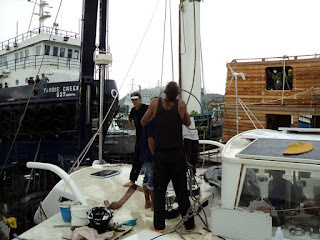 If you own a big sailboat, it is almost impossible to live in SE Asia without going to Phuket every few years. 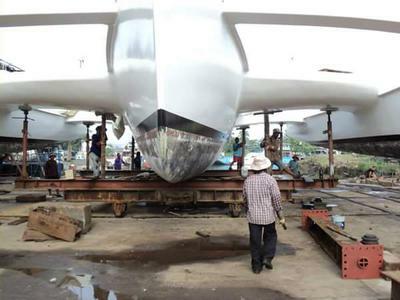 It is the only economical place to haul out a very wide multihull that simply won't fit at most marinas. This Fall we will make a few round trips between Phuket Thailand and Langkawi Malaysia. There are some great islands to stop at along the way and it is always fun to park in front of Patong Beach and have a pool party. Yes that is right. We plan to put a big inflatable swimming pool on the boat, and fill it with fresh water and hot boys. It should be fun and will make for great photographs. 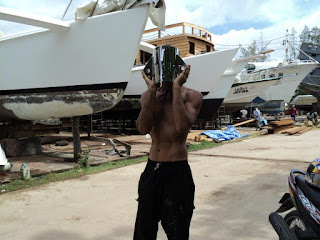 In the mean time, have a look at some of the photos when I hauled the vessel out in Phuket. You likely have no idea the hundreds and hundreds of hours that went into making a vessel of this size. Even a major renovation is an extensive amount of work. During the peak, I employed 41 workers. Additionally, I was renting an apartment to store items, 2 hotel rooms, 5 motorcycle rentals, meals, and yes at the end of the day I needed a massage therapist. Example of the work from the metal shop. Notice my stomach. There is no better way to drop weight than to be working in the heat of Thailand and trying to keep 39 different people working in 5 different locations. I think I had to run and buy sandpaper about 10 times. Yes, I admit it. It is indeed a prop. I had the prop enlarged for better fuel economy. I also have a folding racing prop. PS the prop is real..but that hair color. Hmmm. 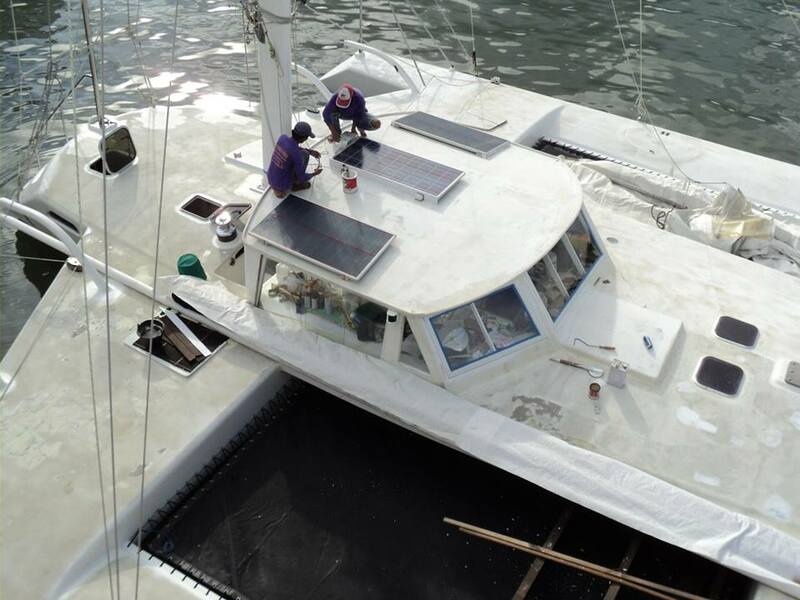 I later installed much bigger and more efficient solar panels in the Philippines. Everyone is free to charge their computers all they want during the day. It is enough power to run the watermaker and the vacuum cleaner. To the left is the Port Ama, and to the right is the central haul called the Wa'a. These are connected together by three Aka. Lets not talk about how much the paint you see cost. 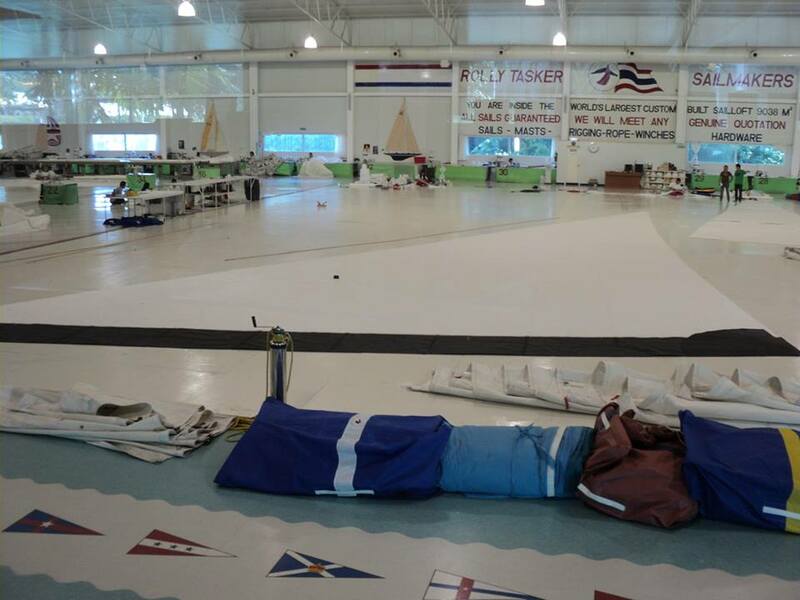 Here is the mainsail in production at Rally Tasker. I have subsequently had Hyde Sails in the Philippines recut the sail smaller and more manageable . Notice the yellow hat on the solar panel. You will see that in the crew photos. That is me in the front and Igor one of the Russians behind. Just look at the anticipation in my shoulders! The mast being set was 81 feet tall. I have since changed that too. 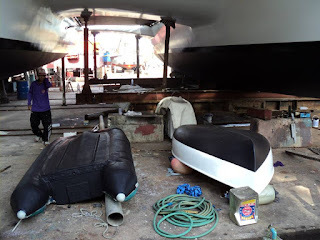 It is now far more manageable and located in the front of the boat. If you have some time, I can tell you a lot more about why I first placed it in the back. A sample of some of the interior work. The big slot was made for the oven. 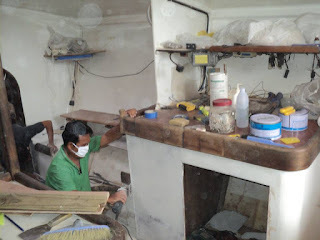 The carpenter is Khun Chow.